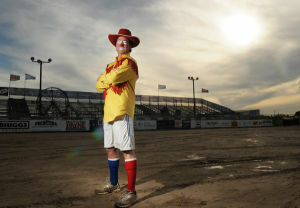 John Harrison is a noted rodeo clown and barrelman. He comes by his profession honestly. His late grandfather was rodeo legend, Freckles Brown. (Freckles rode the "unrideable" bull Tornado, the subject of Western Music songs, and was a World Champion Bull Rider) John was around rodeo and rodeo people his whole life. 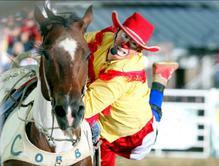 John became a member of the Professional Rodeo Cowboys Association (PRCA) in 1999, as a trick and roman rider, and trick roper. He later diversified and added barrelman to his PRCA card. 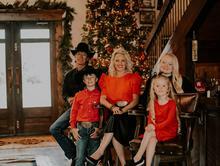 John has worked rodeos from coast to coast and has made 7 appearances at the prestigious Wrangler National Finals Rodeo in Las Vegas, NV, three times as a specialty act performer and four times as a barrelman. 2012, 2014, 2015 John picked up the coveted award of Comedy Act of the Year. He brought home the gold buckle that represents his achievement as Coors Man in the Can 3 times . He feels blessed to be doing what he loves and with those he loves at his side. John married in 2006. He and his wife Carla have had four children; daughters Addison & Billie (now an angel in heaven), Charlee, and son, Cazwell. You won't often catch John with out his family. Rodeos seem more fun with them at his side. Committed to providing quality family entertainment.